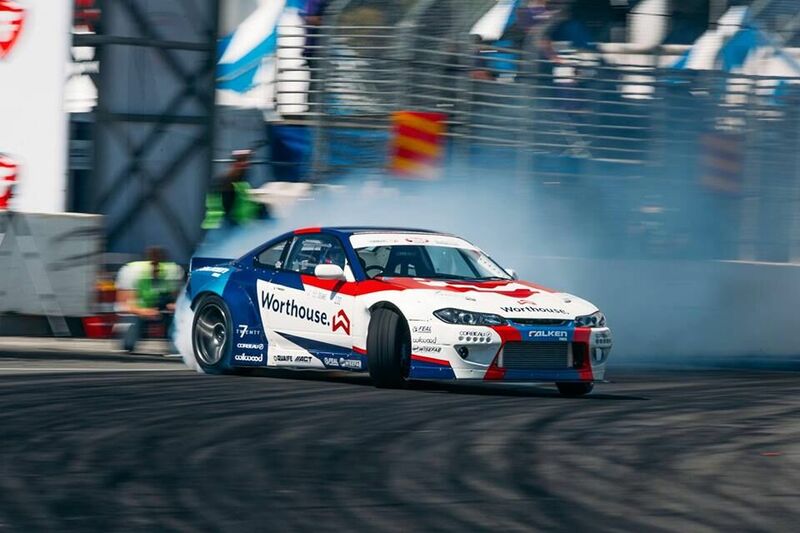 James Deane swept away the best Formula Drift had to throw at him, in a scintillating return to the US series. Since his previous foray Stateside in 2010, Deane has taken every single title Europe has to offer. 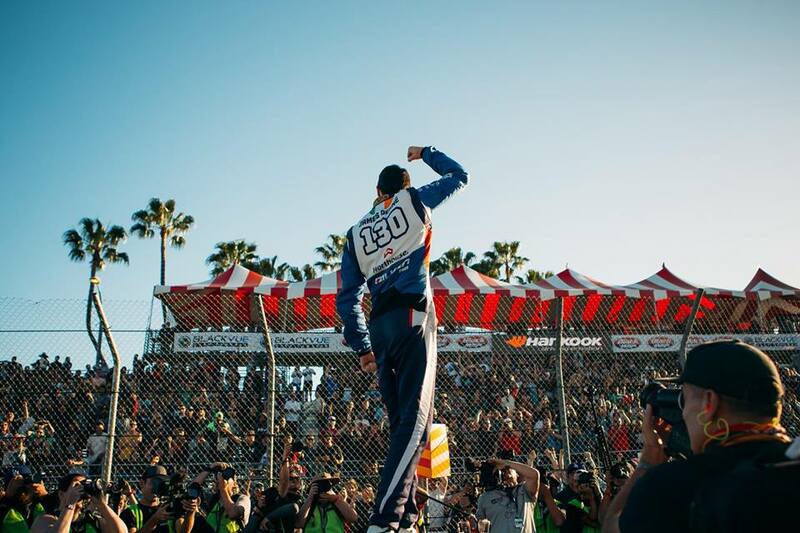 The streets of Long Beach provided the latest hurdle for “The Machine” to tackle and he slid his way to the very top step of the podium with style, speed and a the usual James Deane modesty. He couldn’t quite believe it. Following in older brother Mike’s footsteps (who was a very successful drifter himself after a spell rally driving) James started his career in 2006, aged just 15. The venue – Rosegreen in Tipperary a place now known as the birth place and spiritual home of drifting in Ireland. The Deane family arrived for at that event with nothing more than a Ford Sierra estate and a differential welded solid for teenage James. It typified Irish drifting at the time; cheap and cheerful and perfect to see if you had the skill to make it in the sport. James had composure, control and talent. It was inevitable that he would get better machinery to compete in. A Nissan S-Chassis was source, an Irish pro licence followed and the events racked up. It was this Nissan S14a that got James noticed within the pro category and over the next few years he tackled evens across Ireland and Europe,leaving all comers struggling in a wake of tyre smoke. His dominance saw him ranked within the top 20 drift drivers in the world. Since then and until now, James has continued to hone his craft at the helm of an SR20 powered Mazda RX7 as well as the trusted Nissan S-Chassis cars throughout Europe and has remained the ‘King of Europe’ by claiming at least one championship win in every season except for 2012 when he was a close runner up in the ProDrift series. 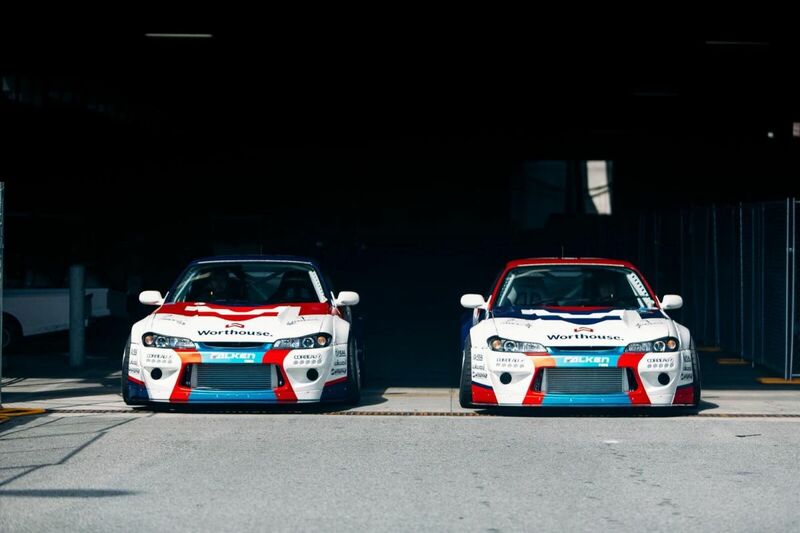 With such success James soon became Brand Ambassador for Falken Motorsports. His success also led to involvement with the sport in the Middle East through Level One Qatar. 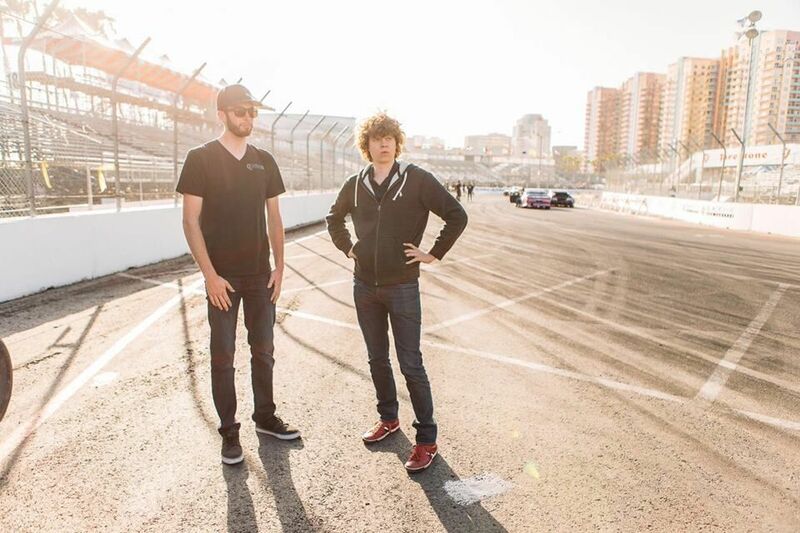 Quite remarkably, he also holds a Guinness World Record for the longest tandem drift. In the last year or two, alongside his continued Falken sponsorship, Deane became part of the Polish based BudMat Auto Drift Team and towards the end of last year an announcement by Paddy McGrath on SpeedHunters, brought the news that we had all been waiting for. 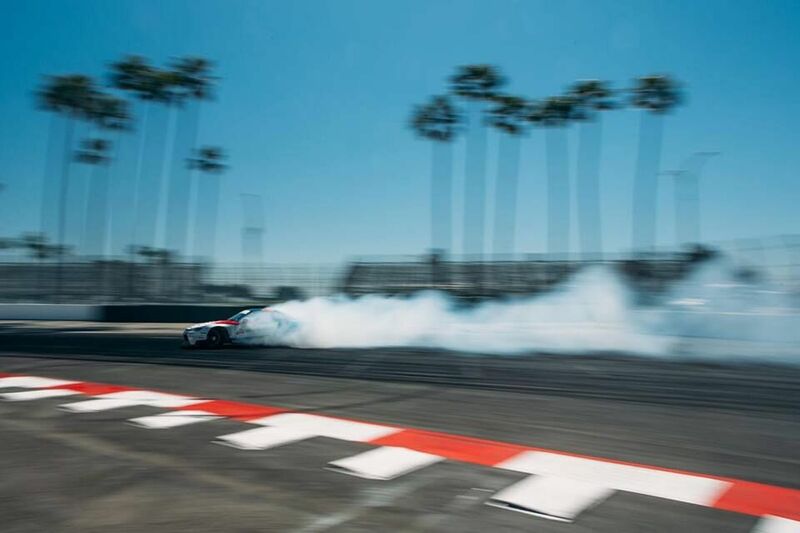 This news was music to the ears of Deane fans across the world, as Formula Drift remains the biggest and best supported drifting championship in the world. James announced his return in the best possible way. By qualifying second. Only seasoned Formula Drift campaigner, Vaughan Gittin Jr posted a better score. 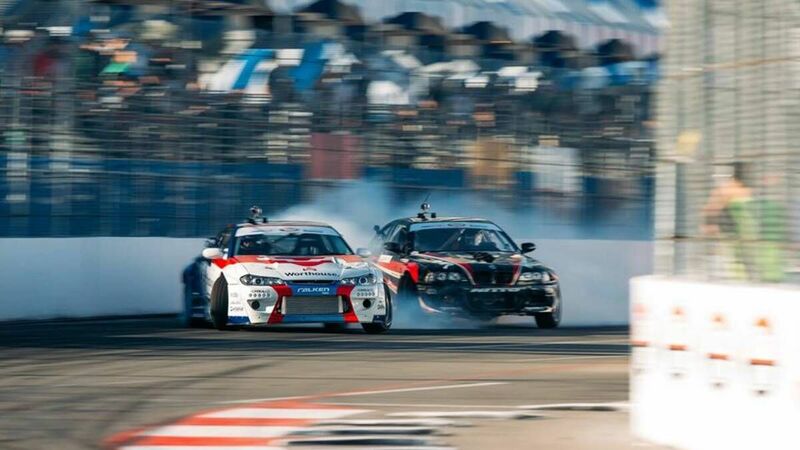 For clarity, drifting is no ordinary motorsport. Drivers are given scores based on angle, speed, transition and\bravery to ‘run the walls’ with the rear of the car, without upsetting the flow of the drift. Deane revealed that qualifying second on his first event of the series was enough to make his weekend. The impending top 16 battle was more or less a dream come true. No result, from then on, could be a bad result. In his first battle, Michael Essa was shown the door by Deane. In the great 8, the Irishman faced Chris Forsberg. He was also put to the sword. In the final 4, Deane was to face Ryan Tuerck. After what is now one of his infamously strong lead drives, Deane’s dream was coming true as he progressed into the last 2 against the BMW of Peru’s Alex Heilbrunn. In interview before the final battle James commented “I honestly can’t put it into words what is happening and it will take while to sink in being my first Formula Drift event in seven years” A smiling Deane continued “thanks everyone involved as its not just me or my driving, it is family friends and sponsors that have made this possible”. A relaxed looking Deane finished by saying “I have no words, I am on top of the world and will try and do my best – I think I will just fall asleep after the event as all day I am pumped on adrenaline its just incredible and I owe so much to everyone around me and to especially to Piotr Więcek and Worthouse”. Needless to say, James Deane showed the world who is boss by taking a convincing win over an overly confident Heilbrunn and stepped onto the top of the rostrum a very proud young man in front of his friends, family, team and supporters across the globe. Having been fortunate enough to see James at the start of his career, I was overjoyed to watch him in California. For me, James is now where he has been destined for a long time – on top of the world. I watched it lastnight and by jeez he done well. A few others seemed to be brakechecking while doing their lead runs making it more difficult for him but I think the judges picked up well on that. Well deserved win. Was so consistent on his lead runs and was right up on doors during chase runs - typical James Deane just. Be interesting to see how he does over the season on tracks he hasn't driven before. Tried to stay awake to see the last few runs but fell asleep. Watched it Sunday morning and it was a great drive from him. The FD livestream and commentary doesn't seem as exciting as the IDC one though. It still baffles me how the drivers know when to transition as the chase car through all that tyre smoke. Serious skills. Great to see him on the podium. I was competing against him back in the Rosegreen days and even then you knew there was an extraordinary level of raw talent there. Its absolutely fantastic to see Irish drivers making waves stateside and long may it continue! This performance is every bit as big as Meeke's win on WRC Mexico to put it into perspective for the non drift followers! Good to see James doing his thing and winning. I first saw him at Tullyronan in his old RX7 and he just sat on the walls the whole way round no one could come close to him and the pressure he put on other driver`s while chasing was immense he just sat on the passenger door. What Is the rules to this .Is it just to see how close you can stay to the car in front or have you to try and get past him .sorry for stupit question but it's only easy if you know the answer lol. | What Is the rules to this .Is it just to see how close you can stay to the car in front or have you to try and get past him .sorry for stupit question but it's only easy if you know the answer lol. Theres a bit more to it than that, the following driver still has to take correct lines and maintain angle etc. But essentially you do just have to stay as close as possible without interupting the other driver. If you pass then i think its an automatic zero for the driver who was leading on the run?